NEW ORLEANS – While the top two teams in the nation might have remained the same for the third consecutive week, that doesn’t mean that the rest of the rankings didn’t experience a heavy shake up in the latest edition of the NCAA Division I Women’s Indoor Track & Field National Rating Index released by the U.S. Track & Field and Cross Country Coaches Association (USTFCCCA) on Monday. Outside of top-ranked Arkansas and No. 2 Southern California, every other team in the top-25 experienced some kind of movement. The big changes have to do with this being the first week that only this year’s performances are used to calculate the TFRI. Expect more big changes along the way as teams are gearing up for the 2019 NCAA Division I Indoor Track & Field National Championships that takes place Friday, March 8 through Saturday, March 9 at the Birmingham CrossPlex in Birmingham, Alabama. For the fifth week in a row, the No. 1 spot in the country goes to Arkansas after the program picked up 227.43 points. The Razorbacks were split between its Tyson Invitational and the Husky Classic over the weekend. Joining the index with their performances this week was Janeek Brown (now second in the country in the 60H), Lauren Gregory (sixth in the 3000) and Taylor Werner (seventh in the 3000). Arkansas holds an impressive 93.71 point lead over the next closest program. Is is the most consecutive weeks spent at No. 1 by the Razorbacks during a single season. The program record for time spent in the top spot overall is eight straight weeks that was achieved between the end of 2015 and the beginning of 2016. Staying put at No. 2 was Southern California with 133.72 points. The Trojans returned from a short time off with the Tyson Invitational this past weekend. Chanel Brissett recorded the top time in the country in the 60H while the team’s 4×400 relay posted the second-best time currently. Other top performers included Kyra Constantine (13th in the 400), Jemima Russell (14th in the 800) and Twanisha Terry (16th in the 200). Shooting up nine spots to No. 3 was LSU after it recorded 107.25 points. The Tigers spent the weekend competing at the Tyson Invitational and the Iowa State Classic. The sprints group was the standout from the meets as Kortnei Johnson is now second overall in the 60, Tonea Marshall is fourth in the 60H and Kortnei Johnson and Sha’Carri Richardson are tied for seventh in the 200. It is the best mark received by the program in the ratings since the final rankings of the 2013 season. Climbing up two spots to No. 4 was Oregon after it registered 106.06 points. The Ducks had athletes competing at both the Don Kirby Invitational and the Husky Classic and saw top performances out of Jessica Hull (second in the nation in the 3000) and Susan Ejore (11th in the 800). Ascending five spots to No. 5 was Kentucky with 91.30 points. The Wildcats had units going at the Iowa State Classic and the Clemson Tiger Paw Invitational over the weekend. Top athletes included Kianna Gray (now 10th overall in the 60), Masai Russell (tied for 14th in the 60H) and Faith Ross (also tied for 14th in 60H). Rounding out the rest of the top-10 was No. 6 Florida (88.94 points), No. 7 New Mexico (88.38), No. 8 Penn State (79.02), No. 9 Villanova (59.16) and No. 10 Boise State (58.52). It was a new program record for both New Mexico and Boise State. The Lobos previous best was eighth (achieved multiple times) while the Broncos was 11th (Week 2 of 2017). It was also the best mark achieved by Villanova since the final rankings of the 2010 season. The top-25 saw the biggest improvements by No. 14 North Carolina A&T (up 36 spots), the previously mentioned Villanova squad (up 24) and No. 22 Wisconsin (up 19). It was a new best for the North Carolina A&T program and the highest mark achieved by Wisconsin since the opening few weeks of 2016. The largest gain in the nation this week belonged to No. 37 Monmouth who shot up 61 spots. Other big movers were No. 66 Arizona (up 41), No. 77 TCU (up 41), No. 48 Wyoming (up 37), No. 55 Penn (33) and No. 63 Virginia (33). In total 23 new programs made the rating index after being unranked the previous week, led by No. 54 Omaha. 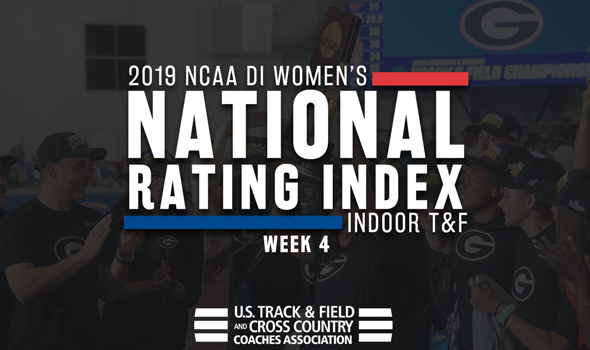 The next DI National Track & Field Rating Index will be released on Monday, February 18.